Amazon’s business subsidiary, Amazon Web Services, has announced a new initiative to get companies using Alexa in the office. The company imagines that the virtual assistant will help employees launch conference calls, organize room bookings, and even wrangle with their expenses. With the new scheme, Alexa for Business, companies will be given the tools to manage a fleet of Alexa-enabled devices. Admins will be able to enroll users, enable and disable skills, and connect Alexa to their conferencing equipment. They’ll also be able to build their own apps for the assistant, with Amazon suggesting functions like helping with directions around the office, reporting problems with equipment, and ordering new supplies. Users will also be able to access their company’s apps from home devices, checking what’s on their office calendar and remotely joining meetings. The office is a big new frontier for Alexa, which has proved to be a surprise hit for Amazon. 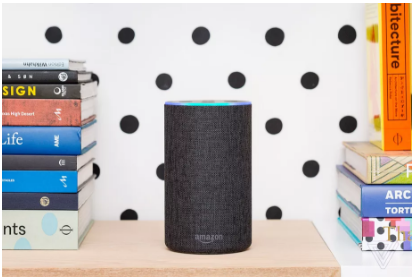 The device launched in late 2014, and kickstarted a trend for voice-activated devices in the home — a category that now includes Google Home and Apple’s forthcoming HomePod. Amazon has quickly capitalized on its lead in the industry, launching a slew of new Alexa devices, including screen-equipped versions for the kitchen and bedroom. The company doesn’t release sales figures for Echo devices, but Morgan Stanley estimates that the company has sold some 11 million units. In a talk announcing Alexa for Business at Amazon’s re:Invent conference today, the company’s CTO Werner Vogels described voice interfaces as the future of computer interfaces. “It’s a natural way of interacting with your systems,” said Vogels. “You ask your environment to give you the right answer.” He described voice as “the first disruption” driven by the contemporary boom in artificial intelligence, particular deep learning. As well as letting companies build their own tools for Alexa, Amazon is working with other popular enterprise firms, including Concur Solutions, SAP SuccessFactors, and Salesforce. It’s also partnering with office space startup WeWork, which is experimenting with installing Echo devices in its workspaces. If other companies follow suit, it would be a whole new domain for Alexa — and Amazon — to master.